I often find that I need to record snippets of information -- the link to this new app, the name of that updated app and so on. These are small items that I need for a specific purpose and usually only for a short amount of time. I often try to remember these notes, but that fails as I forget them as soon as something else grabs my attention. To store these snippets, I have been using NotesTab Pro from FipLab. The app sits in your OS X menu bar and allows you add, delete and edit notes quickly and easily. It lacks the advanced organizational features of an app like Evernote, but I don't need something that complex just to store these transient pieces of information that I come across each day. It's the menu bar integration that sets NotesTab Pro apart from OS X's default Notes. I already have too many apps in my dock and I find it easier to access apps I use a lot when they are located in the menu bar. NotesTab Pro allows me to create notes for the major tasks I do each day -- my Daily Deals post, my Today in the App Store post and my Daily App post. I can drop links, app names, developer names and more into these notes so I can review them later in the day. The app has a handful of useful features such as an option to "star" a note and highlight it as being important, a search box to help you find notes and support for text formatting like bold and italics. The best part about NotesTab Pro is that it stores your data in its own realtime cloud sync service, creating a backup copy in the cloud. This has saved me numerous times when I restored OS X on my Mac and forgot to back up my notes. 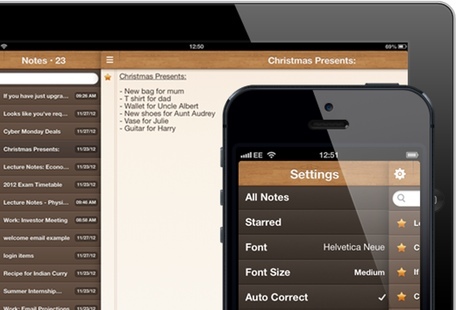 The cloud option also supports syncing, allowing you to share this information to the companion iPhone and iPad apps. This syncing is extremely helpful as I can browse the App Store or web on my iPad and add important information to my notes without having to open my Mac. When I finally switch over to my MacBook Air to start writing, all the new information is available to me with a quick click on my menu bar. NotesTab Pro is available from the Mac App Store for $4.99, while the universal iOS version is available for 99-cents. 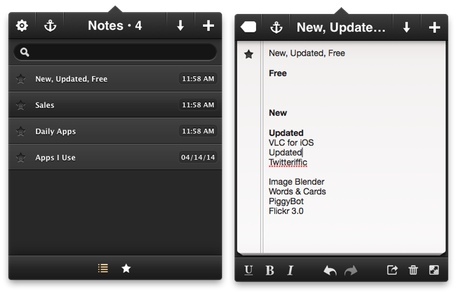 Apps We Actually Use: NotesTab Pro lets me sync notes from Mac to iPad originally appeared on Breaking Apple News, Tips and Reviews from The Unofficial Apple Weblog on Fri, 18 Apr 2014 15:00:00 EST. Please see our terms for use of feeds.